Tuesday, 6th December 2016, Amnesty International release their report “DISPLACED AND DISPOSSESSED: SUR RESIDENTS’ RIGHT TO RETURN HOME”. ,,,despite its World Heritage status and the United Nations Agency’s commitment to protect it. Not since the June 2015 elections (where the AKP & President Recep Tayyip Erdoğan lost their majority) and the July 2015 collapse of the peace talks between the Turkish State and the PKK, (the Kurdistan Workers Party) and the violent military assault on “Turkish” Kurdistan that followed. By early September 2015 curfews had been imposed on the area, electricity and other basic services were cut and by December 2015 those who had not fled or been ordered out by the military were trapped in their homes under an indefinite military curfew; often unable to get food and surrounded by the sound of heavy artillery and machine gun fire as the curfew served as a cover for an extended assault on the different districts of eastern Diyarbakir: “… in early December Turkey’s military went in with tanks, urban assault vehicles and waves of troops to root out the young Kurdish militants. Recent photos and video footage from Sur show scenes of devastation reminiscent of present-day Syria…” Amnesty tells us. 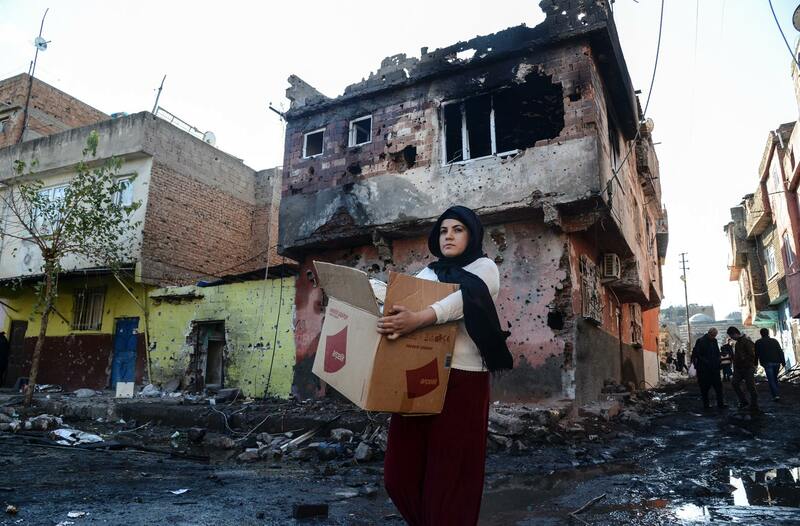 The ‘Displaced & Dispossessed: SUR Residents’ Right to Return Home’ report was released to coincide with the first anniversary of the curfew, December 11, 2015 when an indefinite curfew was extended over 6 of the 15 neighbourhoods of Sur. This figure is part of the overall figure of 500,00 civilians estimated by the Rights organisation to have ben displaced in the entire Kurdish region in response to the level of military force used against both PKK militants and the civilian population. The result of this in the 6 key areas of Sur targeted was almost complete destruction, displacement and a widespread exodus of its people many of whom had been forcibly displaced from the surrounding countryside during earlier periods of military activity. What was the reason for this, other than the military objective of pacifying the activists of the PKK and punishing the rest of the population? “Sur residents are among an estimated half-million people displaced in the southeast of the country in what appears to be a deliberate policy to displace residents and destroy and rebuild urban areas to ensure security through changes in infrastructure and population transfers…” the report adds. Not that this seems to matter to those currently in power in Turkey. The Report concludes with its recommendations to “the Turkish Authorities”…including lifting curfews, helping people to return to their homes and providing financial assistance as well as compensation..
…some hope considering the deterioration of social and political conditions everywhere in this Post-Coup-Turkey and in particular the ongoing war against the Kurdish people by President Erdoğan’s government. We live in hope. Along with the people of Diyarbakir. But winter has come. Especially in Kurdistan. Especially for people without either a home to go to or a house to shelter within.